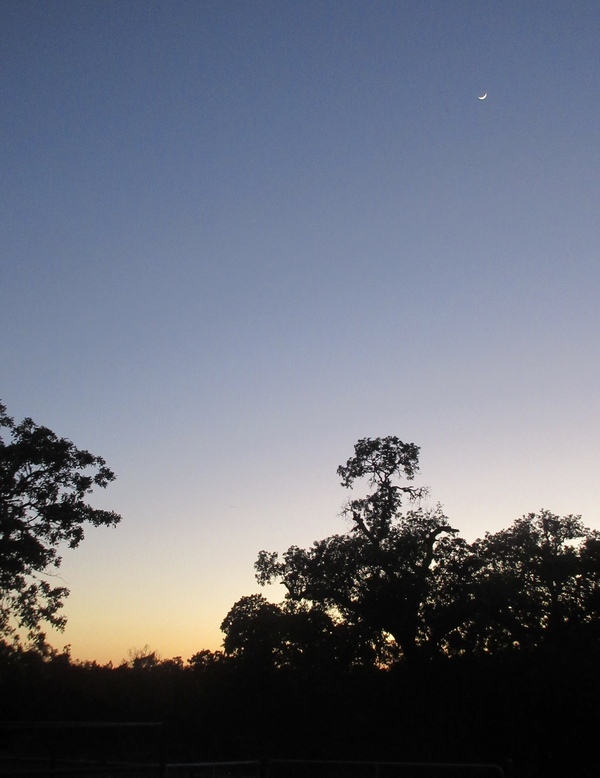 I have been on tour in Texas for the last couple weeks, and I’ve spent much of that time on a ranch owned by my dear friend Valerian. I was here at the Double Z Ranch, ostensibly on a songwriting retreat. But my consciousness was taken over by goats. It’s “kidding season” as they say. 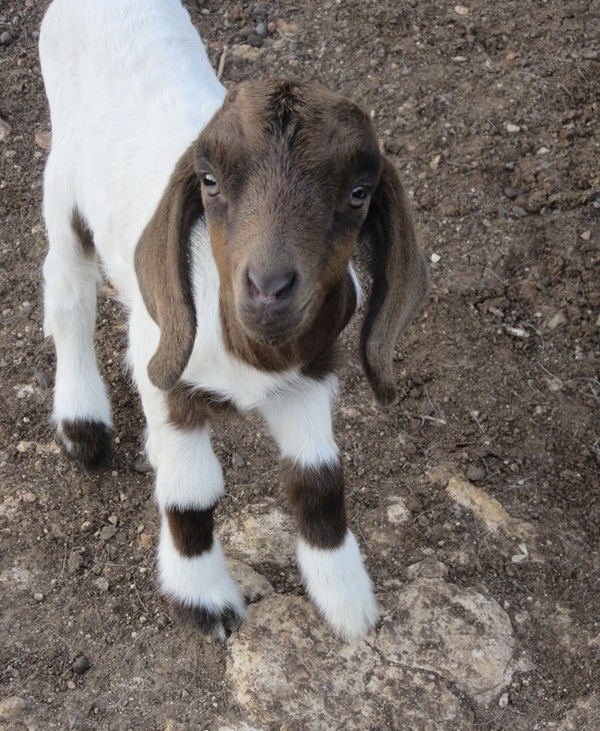 And there are lots of baby goats about. It’s hard to focus the mind on abstractions when one is in the presence of that much life happening all at once. My friend invited me to go with him on my first night on the ranch, to collect the kids that were born that day from out of the woods and bring them up to the paddock where the new moms hang out with their babies. The moms/nannies will go into the woods and find a secluded place to birth. It keeps nanny and kid safer from predators. 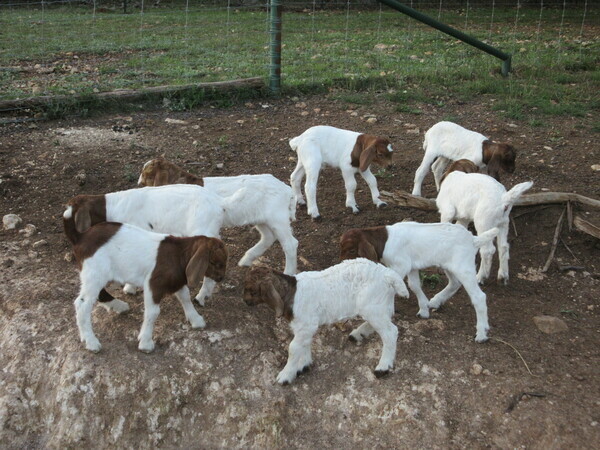 There are currently 25 baby goats between 1 and 14 days old. And they are a hoot! Even newborns will begin butting heads, as soon as they can stand up. It is absolutely hardwired into them to bang their heads into immovable objects to see if they can prevail. If I ever take one of those genetic mapping tests, I suspect there will be some stray strand of goat DNA in my chain. I just feel complete kinship with these animals. They are gentle on whole, not easily excited, and they seem to have a fairly Zen-like approach to life. They have ambition. They have goals. They have needs and they seek to meet them. But they live very much in the present moment. 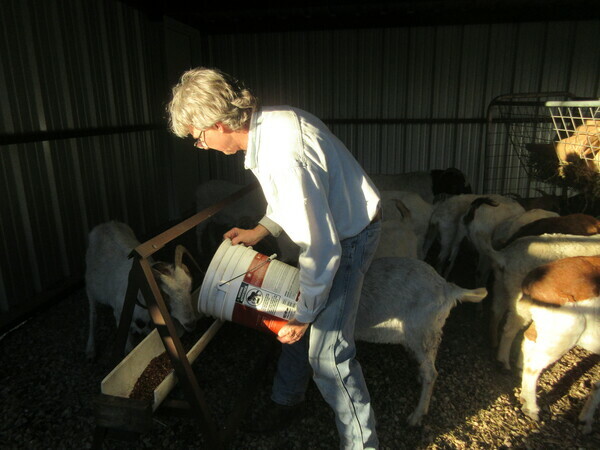 And it is in this practice that I have the most to learn from goats. Not unlike dogs, their favorite moment is NOW. 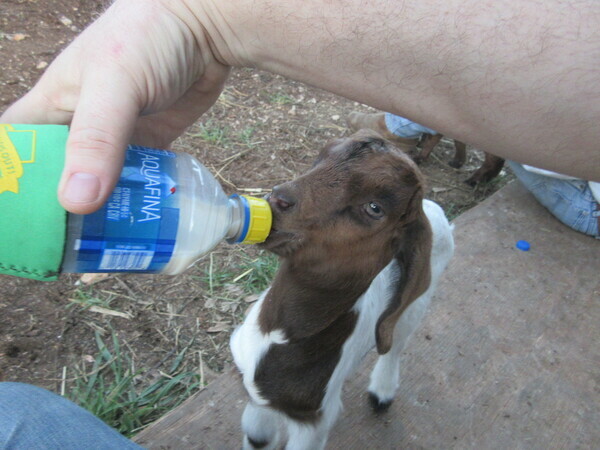 I have to say, one of the more sublime experiences of my adult life has been feeding baby goats with a bottle. Wow. If I was looking for spring and renewal, I have found it here. Life will out. There is no stopping it. And goats, they have a certain joie de vivre that is hard to ignore. I sit on a little knoll, surrounded by baby goats and the kids are all nibbling on my shirt and pants and hair. A few practice ramming my knees or elbows. 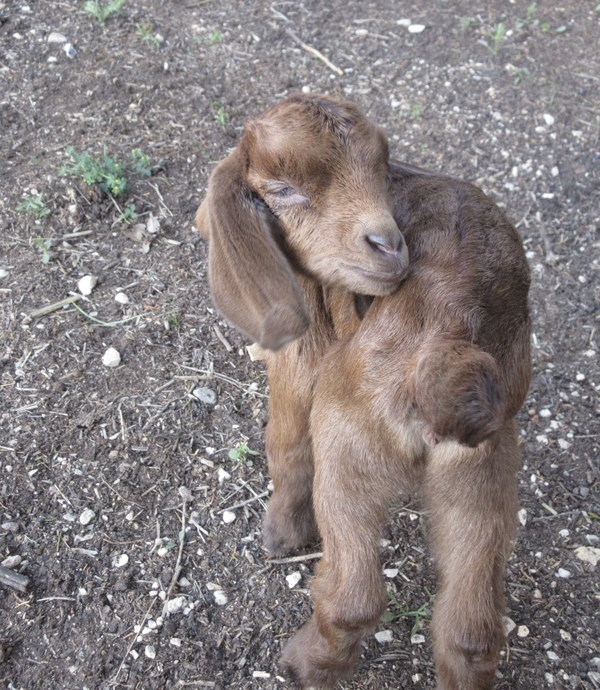 One tries to use his back hoof to scratch his ear, and he knows instinctively even at 2 days old that this is what goats do. But he doesn’t quite have it down. He lifts his hoof a few times toward his ear, and then slowly falls over sideways as if in slow motion. He’ll get there. But I can’t refrain from laughing in sympathy at his awkward experiment with gravity. The baby goats on the knoll also like to jump. I think perhaps it is not even a choice. It is an involuntary tic. They will just spontaneously jump a foot or so vertically into the air. And when 15 or 20 of them are all gathered together in a nursery herd, they bounce up and down like popping corn. Pop, pop, pop, pop! One after another, like they were free dancing at a rave, to music only they can hear. There is no moment other then the eternal now for them. And for a while, there is no moment but right now for me as well. I am consumed and mesmerized by the baby-goat-mosh-pit that surrounds me. And they keep bumping into me and nudging me inviting me to bounce with them. I am content to be on the receiving end of a dozen plus of God’s own battering-rams-in-training. It tickles. They ARE life. I have cares and concerns, fears and worries that the goats do not understand. And they look at me - kids and adults alike, and ask me why I am so busy obsessing about things that are out of my control? There is a beautiful day happening, right now. It is gorgeous. In this specific moment, the sun is warm, the water and food are enough. The company is joyful, and there is a sense of happiness that is unavoidable. It cannot be subjugated by the past or the future. It is now. Come play! The bottles are empty now. The kids have jumped themselves silly and are all snuggling up for a nap. 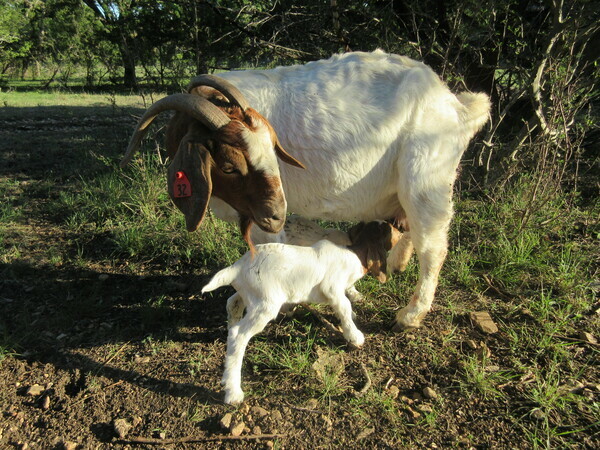 The sun is setting, and I look at a newborn, one of the day’s goats we gathered on our way up the hill. She is snuggled up next to mama and watching her first sunset. Her VERY first sunset! I am moved to tears, inexplicably. But there is something so tender and real, so gentle and peaceful in this moment. Life is good. We are all safe. The evening settles and we all have faith that tomorrow will come, sun shining and full of more perfect moments. The goats teach me what I have come here to know. Not the answers to my complex and convoluted questions, but rather the necessary way to face a world that is so out of my control. Play. Eat. Love. Be silly. Jump and dance. Snuggle. Delight in beauty. Stay close to family and friends. Revel in community. Be grateful. I can do that. The rest will reveal itself.